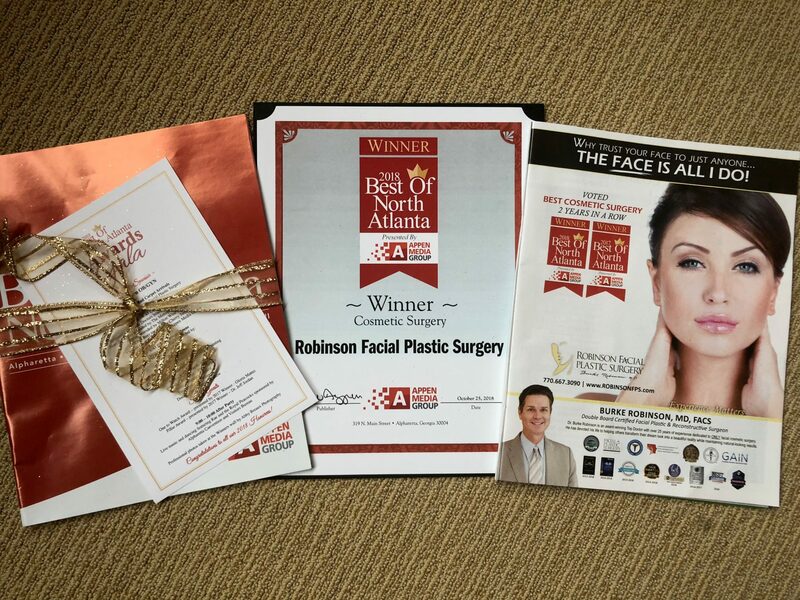 As an award-winning, Double Board Certified Facial Plastic and Reconstructive Surgeon, Burke P. Robinson, MD, FACS specializes in the most advanced surgical & non-surgical facial procedures to enhance and revitalize the appearance while maintaining natural-looking results. For over 25 years, Dr. Robinson has dedicated his attention solely to facial cosmetic surgery. Dr. Robinson has achieved double board certification by both the American Board of Facial Plastic & Reconstructive Surgery and the American Board of Otolaryngology. His expert knowledge of facial anatomy and superior aesthetic sensibility give him the keen insight needed to assess the balance of his patients’ features and develop a personalized surgical approach which boosts overall patient health while also minimizing scarring. 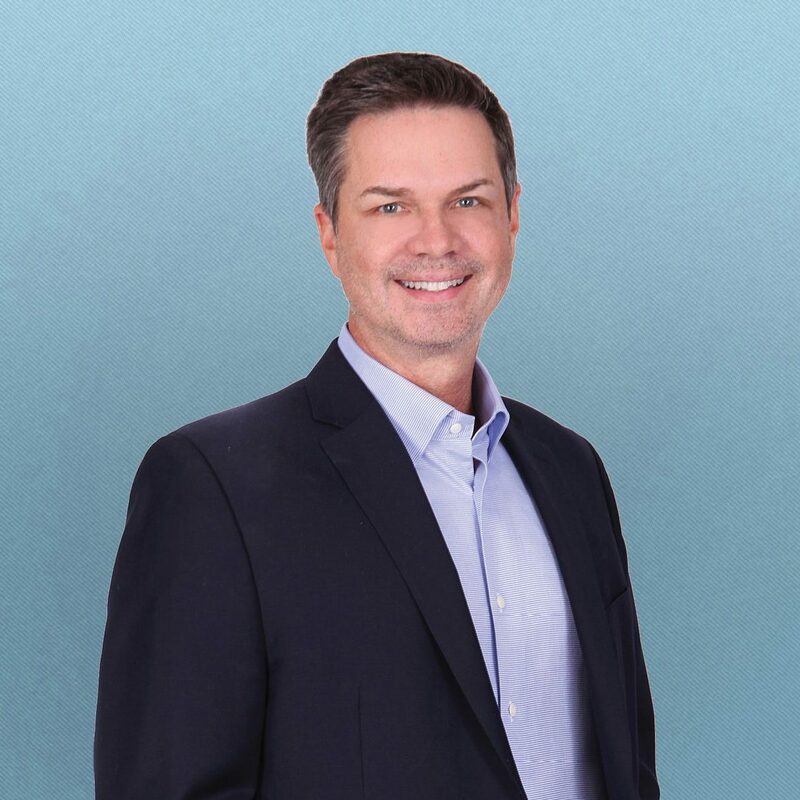 In his practice at Robinson Facial Plastic Surgery (RFPS), Dr. Robinson has assembled a team who shares his commitment to excellence in patient care, education, and safety. Our clients trust our dedicated focus on their needs and our complete respect for patient well-being. We provide the best quality services and concentrate our efforts on helping patients achieve their individual goals. At Robinson Facial Plastic Surgery, our priority is YOU, the patient. Ben Shuster Memorial Award – Honorable Mention. Presented by the American Academy of Facial Plastic & Reconstructive Surgery “In recognition of the Most Outstanding Research Paper in the Field of Head and Neck Plastic Surgery.” Presented September 12, 1992. Dr. Robinson earned his medical degree with honors at the University of Arizona and completed his residency at the University of Minnesota, where he studied head and neck surgery. 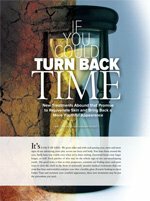 During this time, he also obtained a master’s degree studying wound healing of the face, and his efforts were specifically recognized by the American Academy of Facial Plastic and Reconstructive Surgery as some of the best work done to date in the field. To further his education and training, Dr. Robinson was accepted for a fellowship through the American Academy of Facial Plastic and Reconstructive Surgery (AAFPRS). The AAFPRS fellowship is particularly noted among physicians as one of the most competitive; Dr. Robinson was chosen from among 37 applicants to fill one of only 27 positions available. During his year-long fellowship, Dr. Robinson underwent intensive one-on-one training with Dr. Devinder S. Mangat, one of the world’s foremost facial plastic surgeons. 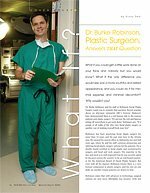 Unlike other plastic surgery fellowships that require the study on the entire body, the AAFPRS fellowship allowed Dr. Robinson to focus solely on facial plastic surgery for the entire year. Inducted by campus college Deans and Alumni Association into Bobcats, the Senior Men’s Honorary, representing the top 13 men on campus. I held office of vice-president and was responsible for the University’s homecoming events that year. Robinson B.P., Hollinger J., Szachowicz E.H., Brekke J.: Calvarial Bone Repair with Porous D, L-Polylactide. Otolaryngology – Head and Neck Surgery. 1995, 112(6): 707-713. Mangat D.S., Robinson B.P. : Adjunctive Treatment of Deep-Pitted Acne Scars. Facial Plastic Surgery Clinics. 1994; 2(1): 69-75. Complications in Head and Neck Surgery. Copyright 1993, Mosby-Yearbook Inc., Part VI, Chapter 72, pp 666-673. Robinson B.P., Hilger P.A. : Hereditary Agensis of Nasal Cartilage – Surgical Implications. Archives of Otolaryngology – Head and Neck Surgery. 1989; 115(8): 985-988. Robinson B.P., Marentette L., Hilger P.A. : An Algorithmic Approach to Zygoma Factures. Results evaluated in 110 Cases. Archives of Otolaryngology – Head and Neck Surgery. Submitted. Robinson B.P., Seeger J.F., Zak S.M. : Rheumatoid Arthritis and Positional Vertebrobasilar Insufficiency. Journal of Neurosurgery. 1986 Jul;6(1):11-1. Robinson B.P., Yates A.: Angel Dust: Medical and Psychiatric Aspects of Phencyclidine Intoxication. Over the course of Dr. Robinson’s academic and professional career, he has performed extensive medical research. Of particular note was his research from 1988 to 1989, when Dr. Robinson performed research as a National Institutes of Health (NIH) Grant Research Fellow. He served as the primary investigator in evaluating the optimum microscopic pore size in relation to conduction of new bone formation through a polymerized lactic acid matrix. The eventual goal was its application in cosmetic and reconstructive surgery of the facial skeleton. The study was based upon his Master’s thesis, and the data evaluated by Dr. Robinson at the Bone Physiology Lab of Walter Reed’s Research Campus in Washington, D.C., in collaboration with Jeffrey Hollinger, D.D.S., Ph. D.
Burke Robinson, M.D.’s extensive study of the functions of the delicate structures of the face and neck informs his work as a facial plastic surgeon. 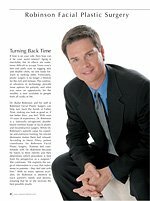 As one of the few plastic surgeons in the Alpharetta area certified by both the American Board of Facial Plastic and Reconstructive Surgery and the American Board of Otolaryngology (head and neck surgery), Dr. Robinson is uniquely qualified to operate on patients seeking to improve their facial appearance. In fact, Dr. Robinson is one of only five plastic surgeons in the country composing the Oral Examination Review Committee for the American Board of Facial Plastic and Reconstructive Surgery. Furthermore, Dr. Robinson has been asked repeatedly since 2003 to serve as an examiner in Washington, D.C. for the annual American Board of Facial Plastic and Reconstructive Surgery (ABFPRS) examination. This group of examiners is comprised of approximately 30 of the most highly respected surgeons in the country, and Dr. Robinson is proud to serve alongside them. 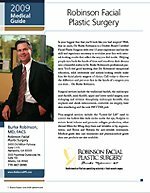 Dr. Robinson has been nationally recognized as an expert facial plastic surgeon by peers and patients alike. He has lectured at medical conferences around the world and is regularly invited to speak on the subject of facial surgery to residents studying medicine. 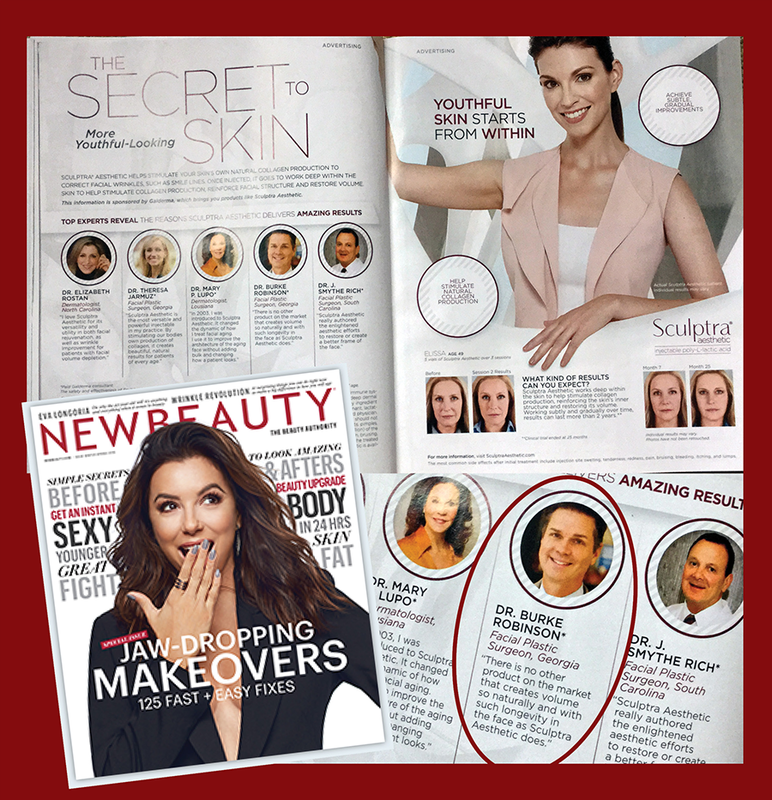 Additionally, he serves as a National Trainer for Galderma Aesthetics on Sculptra®, educating fellow physicians on the benefits and correct, safe application of the injectable filler. Recently, Dr. Robinson was chosen from among hundreds of plastic surgeons across the country to chair a meeting of the American Academy of Facial Plastic Surgery. Dr. Robinson continues his cutting-edge approach with his practice while keeping patient safety and education top of mind. He is an active medical staff member of Northside Hospital, Children’s Healthcare of Atlanta at Scottish Rite, St. Joseph’s Hospital, Atlanta Outpatient Surgery Center, Northside Hospital Outpatient Meridian Mark Center and other local hospitals. Dr. Robinson performs all his surgeries at fully-accredited facilities — scheduling at either Northside Alpharetta Surgery Center or Atlanta Outpatient Surgery Center.